How y’all doing, forex friends! If you’re lookin’ to pillage some quick pips from the Loonie, then heads up because Canada will be releasing its retail sales and CPI reports on Friday at 12:30 pm GMT. And if you need to read up on what happened last time and what’s expected this time around, then today’s write-up is just for you. Moreover, I concluded that probability appeared skewed more towards a downside surprise, based on the historical trends. And, well, we did get a downside “surprise” all right. 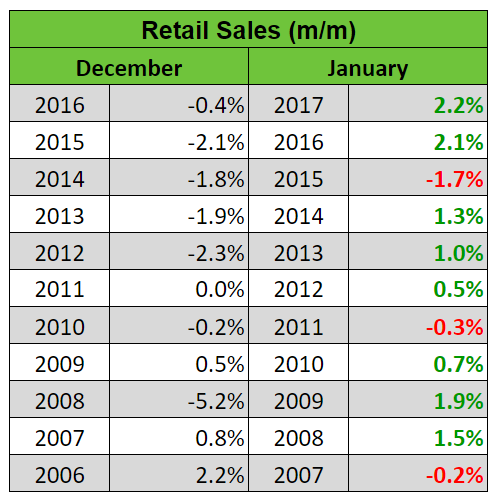 To be more specific, the December retail sales report showed that headline retail sales in Canada fell by 0.8% month-on-month, which is much worse than the expected 0.1% dip. As for the core reading, that plunged by a painful 1.8% (0.0% to +0.1% expected). And since the December Retail Sales report was a disappointment, the Loonie reacted by slumping across the board. Follow-through selling was limited, though, thanks to the rise in oil prices at the time. The consensus among most economists is that retail sales recovered in January. To be more specific, economists forecast that headline retail sales surged by 1.1% month-on-month while the core reading is projected to have recovered by 0.8%. Having noted that, do the leading and related economic indicators offer any clues? Canada’s January jobs report showed that the wholesale and retail trade industries shed 0.8K jobs in January. And Canada’s February jobs report revealed that the wholesale and retail trade industries shed an additional 22.0K jobs in February. Canada’s January trade report shows that imports of motor vehicles and parts fell by 3.1% in January (+2.5% previous). Imports of consumer good, meanwhile, fell by 4.6% in January after increasing by 1.2% previously. Finally, wholesale trade in Canada rose by 0.1% month-on-month during the January period (-0.2% previous). The report also noted that 4 of the 7 subsectors reported higher sales, with personal goods merchant wholesalers being one such sector. However, motor vehicle and parts dealers were not one of them since they reported lower sales. Overall, the leading and related economic reports are pointing to a potential weakness in retail sales, which goes against the consensus that retail sales recovered in January. The only exemption is the wholesale trade report since it showed an uptick in wholesale sales. Although it must be pointed out that the wholesale trade report still showed that vehicles sales fell. 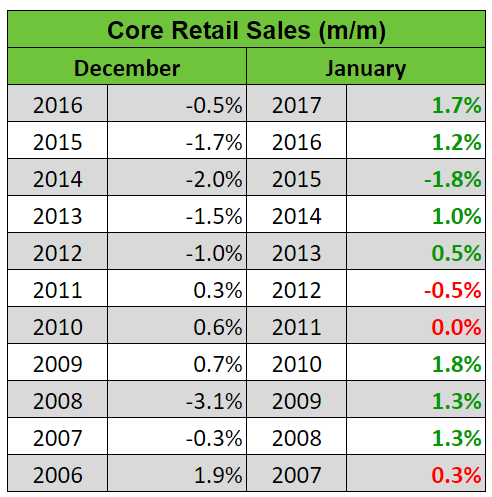 Well, the consensus that headline and core retail sales recovered in January does have a strong historical basis. Even so, economists also have a historical tendency to be too pessimistic with their guesstimates for both the headline and core readings. 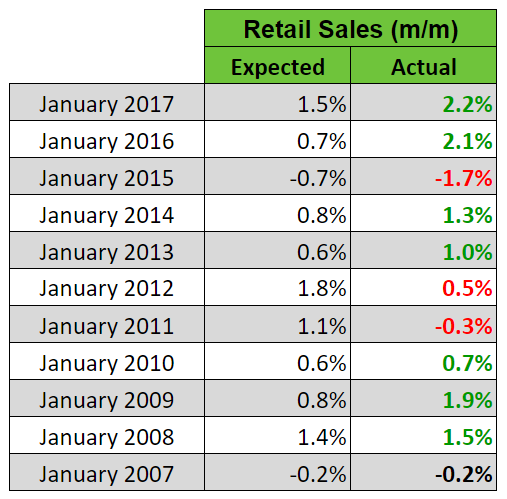 In summary, most leading and related indicators and reports are pointing to the possibility of another poor retail sales report, which is contrary to the consensus that retail sales bounced back in January. Historical trends favor the consensus, though. In fact, historical trends also show that economists tend to undershoot their guesstimates, resulting in far more upside surprises than downside surprises. Probability therefore appears skewed more towards an upside surprise. But as always, just remember that we’re playing with probabilities here, so there’s also still a chance that the readings may surprise to the downside. And remember, most leading and related economic reports were leaning more towards another poor retail sales report. 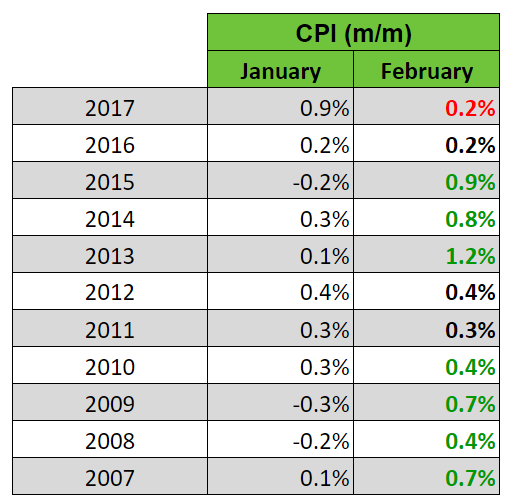 In my Event Preview for Canada’s January CPI report, I pointed out that “the leading indicators point to stronger inflationary pressure in January” and that “probability appears to be leaning slightly more to the upside,” given the historical trends. As it later turned out, we did get an upside “surprise” when headline CPI increased by 0.7% month-on-month (+0.4% expected) and 1.7% year-on-year (+1.5% previous). Not only that, the BOC’s three preferred measures for the “core” reading were also net positive since the common component CPI accelerated from +1.6% year-on-year to +1.8% while the trimmed mean CPI maintained the solid +1.9% pace. The only disappointment was the weighted median CPI since it ticked lower from +1.9% to +1.8%. Overall, however, the January CPI report was rather good, which is why the Loonie reacted by strengthening across the board. There was even some follow-through buying afterward. Most economists forecast that headline CPI rose by 0.4% month-on-month in February, which is a slower rate of increase compared to the 0.7% rise recorded in January. However, the year-on-year reading is expected to come in at 1.9%, which is faster than the previous month’s annual reading of +1.7%. The Ivey PMI report’s prices index eased from 66.6 to 64.2 in February. This is still a relatively strong reading, but it does imply that Canadian companies saw a weaker increase in input costs. In short, both Ivey and Markit suggest that input costs remain elevated and Markit even found evidence that manufacturers are passing on their higher input costs. However, Ivey found that inflationary pressure on input costs did weaken a bit, which supports the consensus that the monthly CPI reading increased at a weaker pace. Okay, let’s now take a look at historical tendencies. And, well, CPI usually accelerates month-on-month between January and February, which goes against the consensus. Moreover, economists have historically been too pessimistic with their guesstimates since there are more upside surprises. To summarize, the leading indicators point to elevated input costs in February. However, they also indicate that inflationary pressure eased a bit, which supports that consensus for the monthly reading. However, historical trends don’t support the consensus since monthly CPI usually picks up between January and February. In addition, economists tend to undershoot their guesstimates. Probability therefore appears to lean more towards an upside surprise, at least for the monthly reading. But again, just be reminded that we’re playing with probabilities here, so there’s no guarantee that the monthly reading will print an upside surprise. Canada’s retail sales and CPI reports will be released simultaneously. If both top-tier reports beat expectations, then that would likely push the Loonie higher while misses will usually cause the Loonie to tank. It does get a bit more complicated if the reports are mixed, though. However, it is the CPI report that usually takes precedence, given its more direct link to monetary policy, with the headline month-on-month reading usually in focus. Also, do note that the Loonie has been taking some directional cues from oil lately, so you may also want to keep an eye on oil prices as well. And if you didn’t know, you can check out oil prices at our Live Market Rates page.